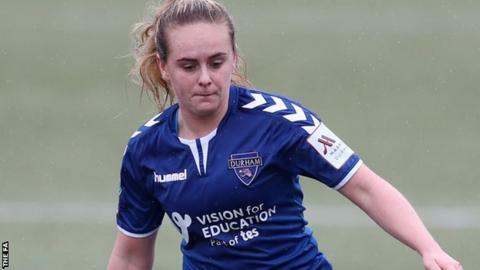 Durham midfielder Beth Hepple knows life with the Women's Championship team is the "polar opposite" to that of Sunday's opponents Chelsea, but the magnetic appeal of the cup is as strong as ever. Hepple, the north-east football writers' women's player of the year, also runs a pub in Birtley near Gateshead, serving food and pints all day before training in the evenings. On Sunday, her in-form semi-professional side will host Women's FA Cup holders Chelsea in the quarter-finals, and the pint-pulling 22-year-old is brimming with optimism. "The group chat was blowing up a little bit when we saw the draw," she told BBC Sport. "At first you think, 'typical, we're getting a top team', but then it sinks in that you're going to be playing some of the best footballers in the world. "It's going to be one of the biggest games of our careers for some of us. It's so exciting to have one of the biggest clubs coming to little Durham." The north-east outfit are fourth in the second tier - behind only leaders Tottenham Hotspur and Manchester United in the table and level on points with third-placed Charlton - have reached the last eight of the cup for the second season in a row. They caused the shock of the last 16 when they won away at top-flight Bristol City in February, but Hepple says the result came as no surprise to the team. "We were major underdogs, like we are this week again," she added. "To be written off beforehand kind of spurred us on a bit more. "We've got some fantastic players, and fantastic people behind the scenes that push us on. That Bristol City game was not a surprise to any of us at all. I don't even think the girls got out of second gear. "We are all so proud of each other for getting to this stage of the cup. It's absolutely huge for a small club like Durham. "It's amazing for young kids coming through from around the area, and for everyone involved in the club it'll be an amazing experience. The north-east has been a hotbed for talent coming through, so we want to inspire the next generation essentially and hopefully we can do that on Sunday." Hepple has been inspired by north-east talent herself, as she fondly recalls watching Sunderland face Arsenal in the Women's FA Cup final of 2009, when she travelled to see the Black Cats lose narrowly at Pride Park. That Sunderland side featured would-be future stars of the England team including Lucy Bronze, Demi Stokes, Lucy Staniforth and Jordan Nobbs, when they were all youngsters. In Hepple's Durham team, similarly, there are a high proportion of youth players, all juggling busy lives outside the game. "A lot of the players are students at Durham University so they mix playing for the University team, studying, working part-time and playing football part-time, so it's such a different environment to what the top league's used to, but it works," she continued. "We've proved what we can do as a team. We know we can bring more to the table on Sunday. "We've got a good mix of youth coming through, with academy players showing us the quality they'll bring in the future. "Everybody in this squad works. Today [Thursday] I've been at work, 07:00-15:00. You have a little nap and then you get ready for training. We train until half-nine or 10 and then you sleep and do it all over again. "I was serving breakfast this morning, serving people pub food and pints at my partner's pub. I do enjoy my job, it gets you away from football as well. "Because we're just normal people and we work, that's kind of your relaxation. It's not football 24-7, so that can be beneficial." Durham are one of three Championship sides to have reached the last eight this season. Elsewhere, Aston Villa host top-tier West Ham United, while title-chasing second-tier side Manchester United are away to Reading. Women's Super League leaders Manchester City host Liverpool in the round's only all-top-flight tie. The draw for the semi-finals will take place on Monday, live on BBC Breakfast on BBC One, shortly after 08:30 GMT, as the road to this year's final at Wembley on Saturday, 4 May continues.